The Supreme Court's unanimous decision yesterday in a jurisdictional fight over the Clean Water Rule has spurred a dash by the Trump administration to finalize its delay of the 2015 regulation and a push by industry groups for a legislative fix. Legal experts see chaos ahead. "This is just all-out war. All-out litigation," Vermont Law School professor Pat Parenteau said in an interview. "This is good news for lawyers, but it is not going to be settled at all." The high court ruled that the 6th U.S. Circuit Court of Appeals lacks jurisdiction to decide challenges to the Clean Water Rule — also known as the Waters of the U.S. rule, or WOTUS — the Obama-era regulation that clarifies which wetlands and small waterways are protected by the Clean Water Act (Greenwire, Jan. 22). The Trump administration had argued for the case against WOTUS to proceed in the 6th Circuit, which would have allowed a court-issued stay to remain in place. It also would have allowed U.S. EPA and the Army Corps of Engineers to take their time on plans to repeal and replace the hot-button regulation. Now the 6th Circuit is expected to withdraw its stay in the coming days or weeks. And when that happens, WOTUS could take effect in 37 states unless a district court agrees to issue a nationwide injunction. EPA and the Army Corps initially proposed their WOTUS delay after Supreme Court oral arguments in December, when the justices indicated they were skeptical of the government's position that the circuit courts had jurisdiction over Clean Water Act challenges. The delay was proposed as the agencies were plowing through more than 700,000 comments on a separate proposal to fully repeal the Clean Water Rule. "The Trump administration fully anticipated the likelihood of the Supreme Court’s decision and put a plan in place to ensure that the policy guidance provided by the president in his executive order would continue while ensuring certainty for states and the regulated community," EPA spokeswoman Liz Bowman said today. "The Trump administration’s proposed rule to change the applicability dates of the 2015 WOTUS rule will very likely be complete before any change in court jurisdiction can be finalized or the Obama administration's overreaching definition of WOTUS can be implemented," Bowman said. But delaying the rule may not be so simple, as environmental groups are almost certain to sue over whatever moves EPA makes. Earlier drafts of the regulation would have changed the "effective date" of WOTUS, and courts have ruled that the effective date of a rule cannot be changed after it takes effect. In its latest proposal, the Trump administration changed that wording, saying it wants to add an "applicability date" to WOTUS. Legal experts say federal judges might not see a difference (Greenwire, Dec. 14, 2017). Bowman didn't respond to questions about the Trump administration's timeline for a finalizing a WOTUS repeal. But the administration's June proposal doesn't include discussion of the scientific basis for the Clean Water Rule, including a 408-page technical report offering scientific justification for what streams and other water features were included or excluded from the regulation. Experts say that puts both a delay and a repeal at risk during litigation. "If the administration had taken the time to put out proposals that truly and fully engaged with the merits of the Clean Waters Rule and tried to come up with a new read, then it would be ordinary days in the courts," Georgetown Law professor William Buzbee said. "But anything they do now, given their proposals, is likely to be legally vulnerable." If several courts are simultaneously considering lawsuits on both WOTUS itself and a delay or repeal of the rule, things could get even more confusing. Plaintiffs in the current case against WOTUS are likely to ask district courts to implement their own nationwide stay. At the same time, if environmental groups sue over a Trump administration proposal to delay WOTUS until 2020, one of their first moves could be to ask for a stay of that regulation. Larry Liebesman, a former Department of Justice attorney who is now a senior adviser with Washington water resources firm Dawson & Associates, said it's not clear what would happen if both regulations are stayed nationwide. But, he said, he doesn't believe a judge would allow a stay of the delay, even if it is on shaky legal ground. "I would suspect a district judge would look at how chaotic everything is and say, 'I'm going to deny the stay and keep the status quo until all this is sorted out,'" Liebesman said. There could be more chaos if district courts refuse to issue a nationwide stay for WOTUS. EPA and the Army Corps have said avoiding a patchwork of water regulations is one of their chief motivations for moving to delay and repeal WOTUS — something that Case Western Reserve University law professor Jonathan Adler says wouldn't be unprecedented. In 1993, the 4th U.S. 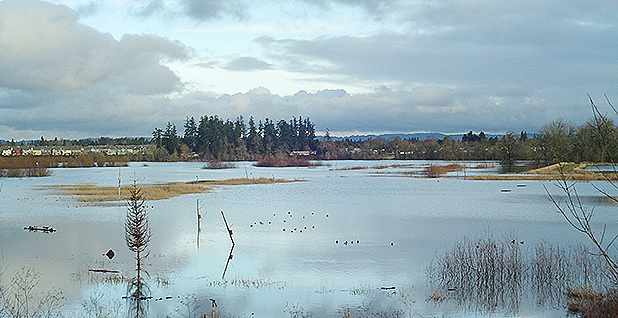 Circuit Court of Appeals ruled that the Army Corps couldn't use the presence of migratory birds to assert jurisdiction over waters and wetlands. It wasn't until 2001 that the Supreme Court voided that part of the Army Corps' regulations nationwide, meaning that for eight years, the Army Corps and EPA didn't apply the rule to Mid-Atlantic states but used it everywhere else. "It's not ideal, but it's not as if we haven't had that before in the context of Clean Water Act jurisdiction," Adler said. "And if we have that again, the republic won't end," he said. "It will be annoying for the government, and it will be annoying for larger entities who have operations in different parts of the country, but eventually, the WOTUS litigation will conclude." Cynthia Taub, head of Steptoe & Johnson's environmental permitting practice, agreed. "The question over what is a water of the U.S. has been a mess for years; that's partly why the Obama administration wrote their rule, because the case law is messy," she said. "This confusion is really just a continuation." Still, that scenario would put the Trump administration in the unique position of having to enforce WOTUS in some states while simultaneously plotting its nationwide demise. Stephen Samuels, a former DOJ attorney, predicted the administration would likely try to avoid enforcing WOTUS. "There's no way that a Trump administration would enforce that rule even if it technically is in effect," he said. But a decision to ignore the Clean Water Rule could also leave the administration vulnerable to more lawsuits from environmental groups trying to compel it to enforce the rule. "There is only so long EPA could get away with that," Samuels said. No matter which path the Trump administration chooses, Georgetown's Buzbee said, there are many ways it could be sandbagged by litigation. "Mathematically, we could chart out a number of different ways this could cut," he said, "but the short story is, we are dealing with a lot of uncertainty." Seeing a tangle of lawsuits ahead, industry groups are vowing a push for Congress to act. There are many appropriations bills that include language to authorize EPA and the Army Corps to withdraw WOTUS "without regard to any provision of statute or regulation that establishes a requirement for such a withdrawal." Don Parrish, senior director of regulatory relations at the American Farm Bureau Federation, said yesterday's high court ruling raises the stakes for congressional action. Provisions being considered would allow the administration to repeal WOTUS without following requirements for public notice and comment under the Administrative Procedure Act. Options for challenging a repeal would shrink if those provisions clear Congress. "It is even more important than it was before," Parrish said. "I think Congress has an interest in not seeing a patchwork of regulations go into play. They should err on the side of consistency and certainty." Vermont Law professor Parenteau said Democrats may have lost their ability to fight on environmental issues, given Senate Democrats' failed efforts in the recent appropriations showdown to force a deal on the Deferred Action for Childhood Arrivals program, an immigration policy that deferred deportation proceedings for individuals who entered the country illegally as children. "If Democrats have already hung themselves out on immigration, are they going to be willing to jump in front of a big appropriations bill for this? I doubt it," he said. "You can't fight everything. Democrats might just opt to use this as campaign fodder — like 'There you go again; this is what you get with Republicans: You get no clean water.'" Parrish said both the Farm Bureau and the Waters Advocacy Coalition — more than 60 industry groups seeking to limit federal regulations — will be asking Republicans to push for WOTUS language. While declining to comment on how he thought Democrats would respond, he said, "There are a whole lot of issues that are important to a lot of different people." He added, "In any negotiation, nobody gets everything they want."